Members of The Church of Jesus Christ of Latter-day Saints always celebrate the opening of a new temple—and the recently finished Meridian Idaho Mormon Temple is no exception. It was especially exciting for me and my family because we were able to take part in the celebrations. The youth in the Meridian Idaho Temple District performed for several leaders of The Church of Jesus Christ of Latter-day Saints. Three of my four kids danced in that Cultural Celebration, and my youngest, my husband and I got to sit in the stands and watch them. Then the next day, we were all together in the Meridian Temple for the dedication. It was a weekend of celebrating our Idaho culture, our spiritual heritage and our new temple. The most holy places on earth are the temples. In the temple, worthy members of the Church receive the greatest blessings anyone can aspire to as we make sacred covenants with God. We also help make those same blessings available to our ancestors who died without receiving the necessary ordinances of salvation. … The end of all activity in the Church is to see that a man and a woman with their children are happy at home, sealed together for time and for all eternity. The temple is the house of the Lord. The basis for every temple ordinance and covenant—the heart of the plan of salvation—is the Atonement of Jesus Christ. Every activity, every lesson, all we do in the Church, point to the Lord and His holy house. Our efforts to proclaim the gospel, perfect the Saints, and redeem the dead all lead to the temple. Each holy temple stands as a symbol of our membership in the Church, as a sign of our faith in life after death, and as a sacred step toward eternal glory for us and our families. Who Can Go Into a Temple? 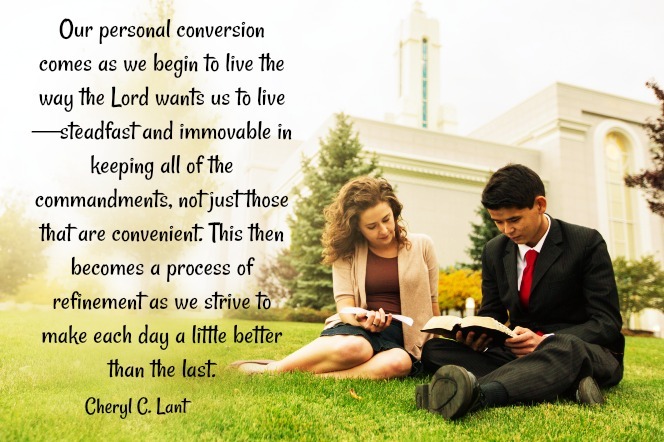 The covenants we make with the associated ordinances we receive in the temple become our credentials for admission into God’s presence. These covenants elevate us beyond the limits of our own power and perspective. We make covenants to show our devotion to build up the kingdom. We become covenant people as we are placed under covenant to God. All the promised blessings are ours through our faithfulness to these covenants. Youth who are 12 or older can participate in what is called baptisms for the dead, which is baptism by proxy for those who are deceased. Adults can participate in additional ordinances, which include initiatory ordinances, endowments, marriages, sealings, baptisms for the dead, and ordinations. I love the temple. For me, Mormon temples are places of peace and refuge from the chaos of the world. I love going with my husband and also with my older three kids. Because my youngest just turned 10, he isn’t eligible to go into the temple yet, except during an open house and a dedication. So it was a special experience for us to be able to be in the Meridian Temple together, as a family. The entry of the Meridian Idaho Temple. Members of The Church of Jesus Christ celebrate when new temples are announced, built and dedicated—especially when they live nearby the new temple. We were excited when the new Meridian Temple was announced during General Conference on April 2, 2011. It was fun to see the groundbreaking on Aug 23, 2014. And we watched the progress as it was being built. But the real celebration began after it was completed. The first part of the celebration for a new Mormon temple is the open house. After a new temple is built but before it is dedicated, The Church of Jesus Christ opens it up for public tours. The tour includes a video explaining what temples are and how they are used as well as a walkthrough tour of the rooms. Thousands of people walked through the Meridian Idaho Temple during the three weeks of the Open House. We have taken our kids to as many temple open houses as we could—including a four-hour-plus trip to the Twin Falls Temple. My husband and I even had the opportunity to serve as tour guides during the Open House for the rededication of the Boise Temple in the fall of 2012. During those tours, I was always struck by how strong the Spirit was every time we walked through the doors of the temple with a new group. At the end of the open house, the temple is closed for a week for cleaning. Then the final two parts of the celebration. 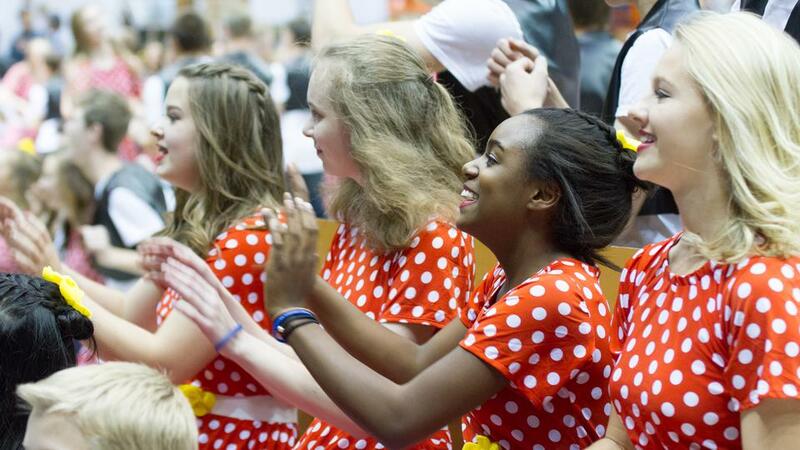 For this event, there were about 6,000 youth ages 12 to 18 years old participating. That’s a lot of kids, and doesn’t include chaperones and leaders. My kids started practicing their dance in September, and I’m guessing the other youth groups did, too. At least once a week for two months these kids worked to learn and perfect this dance routine. They even traveled an hour-plus to practice with all of the youth from our stake. And parents (mainly moms) helped to make costumes for the kids. Why did we all go through so much for work for a performance that would last an hour? Because it was a celebration of our heritage, our Church and our temple—and we knew that some of the Lord’s representatives on earth would be in attendance. … The apostolic and prophetic foundation of the Church [is] to bless in all times, but especially in times of adversity or danger…. 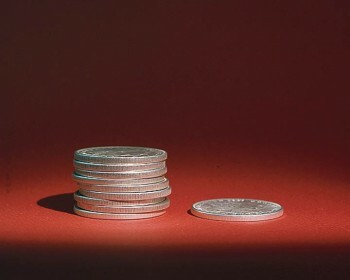 Against such times as come in our modern day, the First Presidency and Quorum of the Twelve are commissioned by God and sustained by you as prophets, seers, and revelators, with the President of the Church sustained as the prophet, seer, and revelator, the senior Apostle, and as such the only man authorized to exercise all of the revelatory and administrative keys for the Church. I don’t want my kids to believe this because my husband and I believe it. I want them to understand and know for themselves the truthfulness of the gospel and the reality of living prophets. I had to find out for myself. I remember being at the Tabernacle in Salt Lake City years ago when then-President Gordon B. Hinckley walked in. He passed about 30 feet in front of me, and as he walked by I felt the Spirit and knew that he was called of God. I was so excited for my children to have a similar experience. And they did. 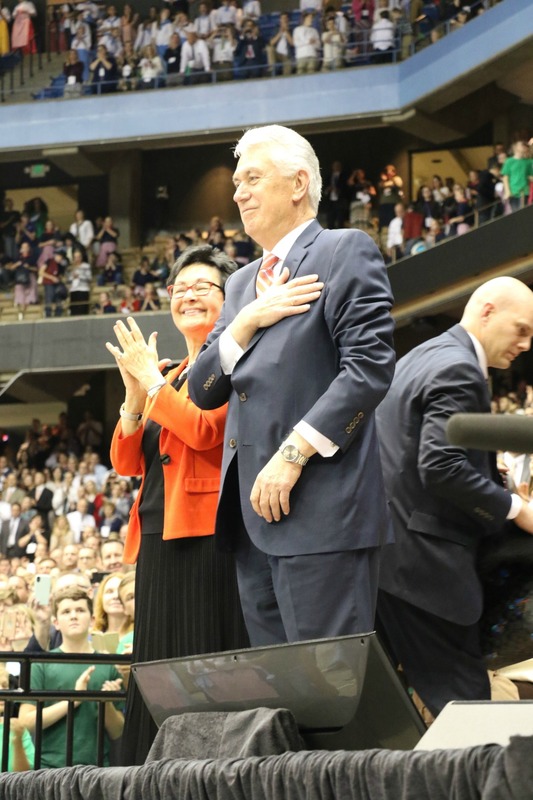 President Dieter F. Uchtdorf and Elder D. Todd Christofferson, both Apostles and prophets of The Church of Jesus Christ, attended the Youth Cultural Celebration, as did their wives and other Church leaders. And as they walked in, the crowd of youth roared with excitement. As one young man said later, it was like these men were Mormon rock icons. My oldest son said that he could feel the Spirit when they walked in. He felt the same power and confirmation as I had years ago. These experiences, along with study and prayer, are necessary building blocks for our testimonies. The title and theme for the production stemmed from the name and location of the new temple. Early Idaho surveyors used an initial point—a steadfast and immovable line—from which to take all other measurements. The city of Meridian was named for its location on the Boise Principal Meridian. The Meridian Temple, located close to that line, will serve a similar purpose in the spiritual lives of members through southwest Idaho. “In the temple, we get our bearings. In a way, it represents the line of the Lord which guides our daily decisions,” Marian Workman, the youth cultural celebration event chairwoman, explained. Each performance within the cultural celebration has historical meaning, which the youth then connect to the temple, Workman said. As each of the kids in the different groups practiced their routines, they had no idea what the others were doing or how everything would fit together until the day of the event. But when we saw the entire production, it all made sense. And it gave me a greater appreciation for our temple as well as the city for which it was named. 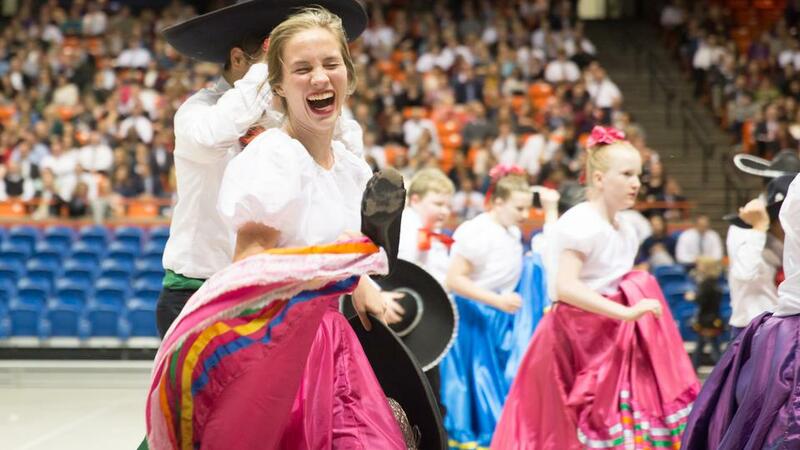 President Dieter F. Uchtdorf and his wife, Sister Harriet Uchtdorf, greet the youth at the Meridian Idaho Youth Cultural Celebration. Here in the wonderful Treasure Valley is a great treasure of young people of faith. … The story goes that at the end of every rainbow is a pot of gold. You are a much greater treasure than any treasure at any rainbow. You are the future of this community, of this area. You are the treasure of all those who live here: your own families, your own generations who passed before and who will follow, and for those who live in this beautiful area. When we look at the terrestrial navigation, which we find with the help of the meridians around this globe, we are also guided towards the celestial navigation. Make sure that you’re following the right path in life. As the years go by, my kids may not remember fully the day, but I hope that they will remember how they felt—and how keeping their eyes on and themselves in the Meridian Temple can help them stay the course. What is a Temple Dedication? Often, there are multiple sessions of the dedication ceremony so that more people can attend. There were three for the Meridian Temple, and we were in the final one. The dedication ceremonies are broadcast to meetinghouses in the temple district. During the broadcasts, the meetinghouses become extensions of the temple, so attendees have a special card signed by the bishop, or leader of the congregation, to enter the building. Members who are at least 8 years old and in good standing, which means that they obey the laws and commandments of God, are eligible to attend the dedication of a temple. “In whom all the building fitly framed together groweth unto an holy temple in the Lord” (Ephesians 2:19–21). This is a ceremonial moment when we mark this great occasion by sealing the cornerstone which represents, really, the Savior. The Lord is the cornerstone of the work. This is the house of the Lord. The Celestial Room in the Meridian Temple. Every temple, large or small, has its beautiful celestial room. This room was created to represent the celestial kingdom. 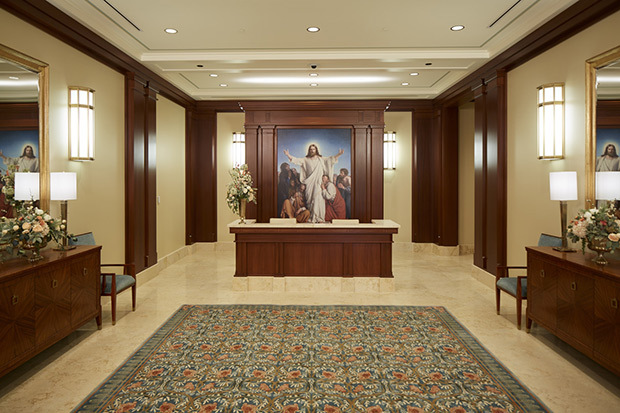 When the Mesa Arizona Temple was extensively renovated some years ago and was opened for public tours, one visitor described the celestial room as God’s living room. So it well might be. It is our privilege, unique and exclusive, while dressed in white, to sit at the conclusion of our ordinance work in the beautiful celestial room and ponder, meditate, and silently pray. Here we can reflect on the great goodness of the Lord to us. Here we can reflect on the great plan of happiness which our Father has outlined for His children. 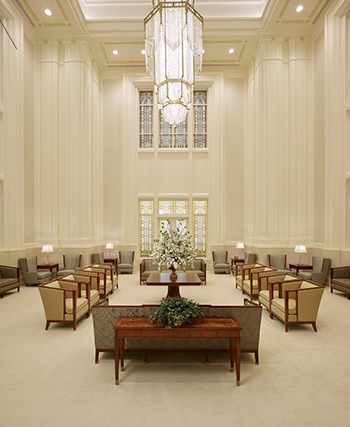 The Celestial room in the Meridian Temple is where the dedication ceremony took place. It was broadcast from there to other rooms in the temple and in meetinghouses throughout the temple district. 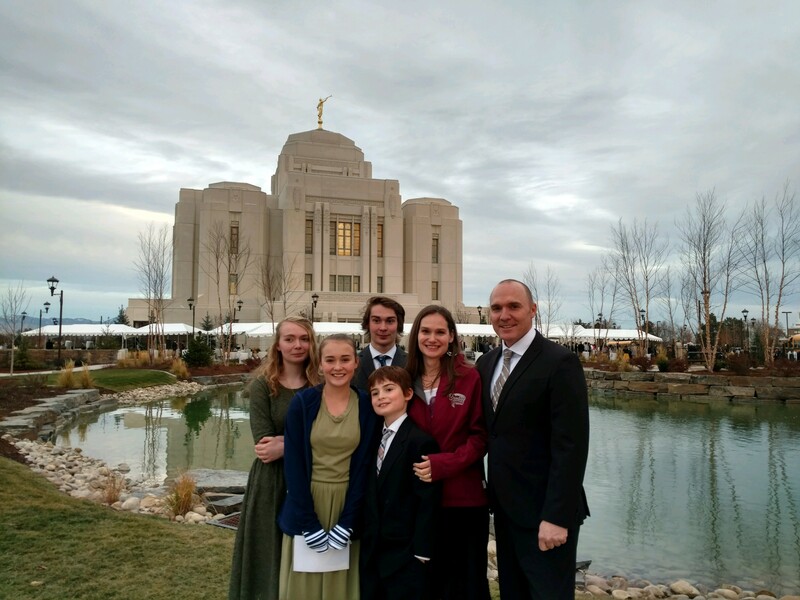 As we were waiting for the ceremony to begin, three of my kids–along with other young people in various rooms in the temple– were invited to sit in the Celestial room. Again, they were in the presence of the Lord’s chosen prophets and Apostles. We watched on the screen as President Uchtdorf and Elder Christofferson shook hands with attendees as they entered, including my youngest son. He said, “President Uchtdorf knows my name.” While it may seem like a small thing, it reinforced to me the love that the leaders of The Church of Jesus Christ have for people. Just as Jesus took time for the one, so did they. My family standing outside the newly dedicated Meridian Idaho Mormon Temple. As President Packer said, the end of all that we do in The Church of Jesus Christ is to see a husband, wife and their children happy at home and sealed together for time and all eternity. That is what our Heavenly Father wants for us. And that is what my husband and I want for our children. 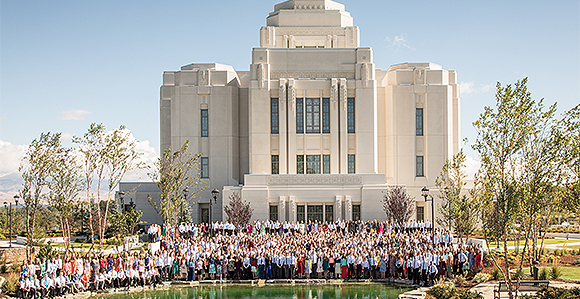 I was so grateful that we were able to sit in one of the upper floors of the Meridian Temple during the dedication, even if we weren’t in the same room. It was a glimpse into what we hope the future holds for our children. And it is a reminder to my children of what they can have in their lives if they follow the teachings of Jesus Christ. 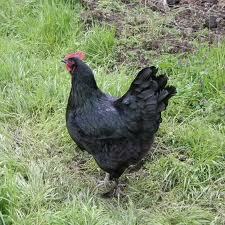 Mormon Beliefs: Tithing and Mitt Romney’s Taxes Keeping God’s Commandments: The Fate of the Beautiful Black Chicken How Do We Judge Righteously in the World Today? Are Mormons Doomsday Preppers?